One of my favorite new map blogs, The Map Scroll, recently covered the thankfully failed effort to criss-cross San Francisco (and other cities) with freeways and the “freeway revolt” against this in the 1950s and 60s. Many excellent sites discuss this one already, especially Shaping SF. My house would have been so under the Mission Freeway that even Tom Petty wouldn’t have been able to sing songs about it. Other exciting SF never-built freeway features included a highway through Glen Canyon and a second Bay Bridge at the foot of Army. Kind of amazing BART got built under these circumstances. SF Cityscape has an extensive bay-area transit map of the future. If I had my druthers, Muni would go farther East, maybe branching off from the J earlier, and the center of town would be able to connect to Balboa Park, as well as being a good bridge for the T to Balboa Park. DAMN. That is sobering. Thank you for taking the time to scan those. I just subscribed to your RSS feed, not sure if I did it correctly though? Solid article by the way. good to see there is still interest in the 30th street BART infill station. How can they get that proposal off the back burner? SF planning should have supported it. Turning the Safeway into a mixed use residential / shopping / transit center would be more useful IMHO. 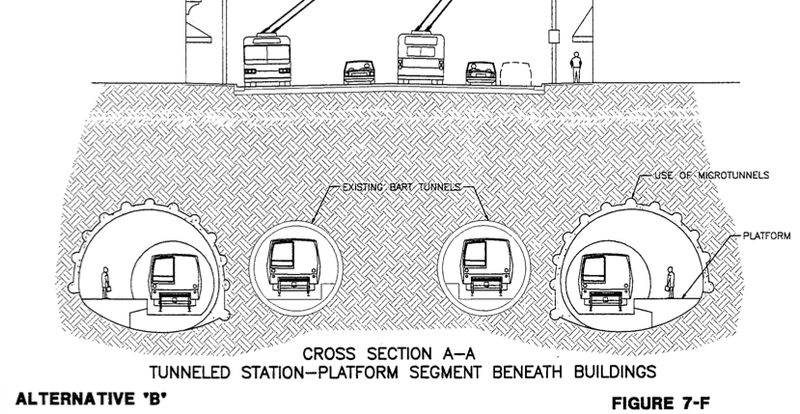 If you *really* wanted to be ballsy, you’d make that the jumping off point for a new cross-bay tube to the Oakland Airport. Maybe the whole thing could be a new BART line that would follow the same route but run under Geary or California instead of Lombard. I’ve communicated twice with Director Radulovich’s office in an attempt to spur this back on track, but it appears that this project is buried for some time now. If the 30th street BART extension would have gone through, it would have been done right about now. The stretch between 24th St and Glen Park is one of the longer ones in the inner BART system – about 2 miles. A station between 30th and Randall would be about half way. BART has done outreach and nearly 2000 people in the neighborhood said they would use it if it were there. The problem apparently is the track grade which is uphill on that stretch of Mission. BART says it needs a certain length of track before and after a proposed 30th St station to make the trackbed level for the station platform. There are subway stations in NY though that are not perfectly level – like 34th St on the BDFM 6th Ave line. At the north end of the station the tracks and platform have an uphill grade.